To start off with, I absolutely loved this book. Not only was I drawn to it because of its simple and beautiful cover, I’d be lying if I said that the Goodreads’ tagline “Devil Wears Prada meets Divergent” didn’t intrigue me. The book did not disappoint me. I loved every second of it and I couldn’t put it down. I haven’t felt this invested in a new book in a long time, so I applaud. I cannot wait to see what happens next in this series, if it does become a series. So far, there is no news of a second book – but I hope that changes soon. The idea behind this book is genius, it basically takes all of our flaws when it comes to following the newest and biggest trends and shoves it right back in our faces. In this world, teens rule the workforce. They are chosen for their lifelong jobs during seventh grade by this thing called the Tap. The world itself is very interesting. Everything revolves around fashion and entertainment companies. Fashion has the Big Five, and since this story is centered in the fashion aspect of this world, I don’t know much about the other half. Even the second point of view, a singer named Ivy Wilde, is more about fashion than the entertainment. This world amazed me, and it also made me think. We really are not far from this extreme that Elaine shows, I mean, we already wait hours – if not days – before the release of a new I Phone, book, movie, or video game. How is this obsession with the new trends that shift almost daily any different? Now, onto the characters. I was confused when the point of view shifted from Marla to Ivy. This was mostly because the first chapter of the book established a first person point of view, but then two chapters later it switched to third person limited with Ivy. I was annoyed with both of them for a majority of the book, but I still love them. Ivy, though, I was still annoyed with at the end. I only saw a change in Marla, at least a change that she stuck with and continued to fight for. Ivy gave in, which I understand but cannot condone. I really can’t wait to see what will happen next, I hope that Marla continues to fight for her ideas and designs. In my opinion, this book was wonderful. I would recommend it to anyone and everyone who asks about it. The world id intriguing, even seductive despite its cruelty. 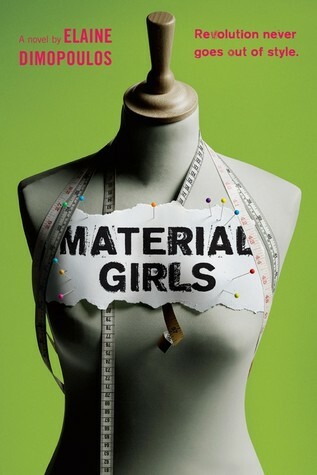 Overall, Material Girls is wonderfully written and an all around wonderful read. Stay young.